Masterful village that oozes flavor; evolution for the series! This installment of Raging Swan Press‘ Village Backdrop-series clocks in at 13 pages, 1 page front cover, 2 pages of advertisement, 1 page editorial/ToC, 1 page SRD, 1 page back cover, leaving us with 7 pages of content, so let’s take a look! Needlebriar is an isolated community, situated in a remote region of a duchy; it is also, in a nice change of pace, a Halfling community. The village takes its name from the rows upon rows of thorny hedgerows that can be found in and around the place, providing a natural series of borders. The red flowers of the hedgerow, as some claim, bloom in this vibrant a color due to the local custom of folks burying their dead beneath them. This rumor, though, is incorrect – like a full half of the rumors circulating around, for a veil of secrecy suffuses the place: The climate is warm and humid, with most Halflings walking through the settlement in heavy cloaks, which may raise a few eyebrows. The supplement, as always, does sport the classic components we’ve come to expect from Village Backdrops – i.e., we get notes on the nomenclature of the locals, their dressing habits, etc. As always, we get rewards for PCs that do the legwork: Village lore may be unearthed and, as noted before, we do get a couple of whispers and rumors. However, in this pdf, we can see the fruits of Raging Swan Press’ patreon support in a rather impressive manner: For one, we do get write-ups for no less than 6 different NPCs, which have btw. been properly assigned 5e-stats from the default NPC-roster, where applicable. The write-ups do contain e.g. notes on gender and the suggested class levels for the characters; the write-ups are fluff-centric and as well-crafted as we’d expect from John Bennett. Now, where we’d expect the marketplace-section, we instead get an evolution of the formula: We still have the general marketplace section, but move one step beyond. You see, while it’s not new to see sample notes for costs of taverns and food/etc. to be included in village backdrops, we now have the individual locations sport the notes for specific services and items, which have been properly converted to 5e. This is surprisingly convenient: Instead of a more or less abstract marketplace, the services and goods are allocated to the places where they can actually be purchased. However, there is more going on: John Bennett, back in the day, introduced a serious array of dressing to a couple of his older settlements, vastly increasing the flavor or the places. Needlebriar does sport a pretty impressive list: A table of no less than 20 entries can be used by the GM to really amp up the tension and unique flavor of the place. Unusually humid days may see dogs panting loudly…and some of these dressing/entry-sections can be used as events to jumpstart the action…there is, for example, one entry where a badly mauled, bloodied man is running down the streets…so yeah, there is a sinister angle to the village, but I am NOT going to spoil it…or the reason for the strange twitches that seem to plague a lot of folks from the local population. Beyond these, we get a great b/w-picture of the settlement and notes on the surrounding area, allowing the GM to better situate the village within the individual campaign setting. Another improvement over the classic formula of the Village Backdrop formula would pertain the respective entries for the locations of interest: Instead of having a single 6-entry event table, we have individualized event tables for the respective locations (under the “What’s going on?”-headers), which adds a further level of customization to the settlement. As a minor note of complaint: One of the entries for local events still refers to the PFRPG-save – that should be Constitution and the condition should have been changed. So yeah, the respective events can actually sport rules-relevant components. Beyond these specialized events, there is a further level of convenience added to the pdf. The respective entries have adventure/sub-quest-hooks added: For example, on Thorn Island, we have a druidic lore angle that may be very important if you choose it to be – for the strange proceedings in the place have something to do with Hunger Devours Moon. What is that? What is truly going on in Needlebriar and its weird Halflings? Well, I could spoil the angle, but frankly, that’d be a disservice to the great supplement. It was actually a hard decision on whether or not to mention the name, but frankly, it is too good an example for the quality of the inspiring prose herein. Editing and formatting are top-notch, I noticed no serious hiccups apart from the save-conversion-relic. Layout adheres to Raging Swan Press’ elegant two-column b/w-standard. The original b/w-artworks are impressive and the cartography of the place is excellent and in b/w. The pdf comes fully bookmarked for your convenience. As always, we get the pdf in two versions: One optimized for screen-use and one optimized for the printer. John Bennett is an impressive author. I have yet to be disappointed by his supplements, and Needblebriar is no different: The changes to the formula of the Village Backdrop-series are great and actually further improve it, enhancing the immediate usefulness for the GM. Beyond the excellent prose, the village excels at immediate usability: Simply dropping the PCs into the village will be enough to provide adventuring opportunities for at least a session or two. The individualized events and dressing-tables allow you to use this village as a go-play supplement. This works perfect without any kind of preparation: You can conceivably just whip this out and read the read-aloud text for the individual locations and the pdf itself as you go and have a great time. The central angle of the village is interesting and the extensive dressing, events and hooks make this basically a free-form sandbox in disguise. Yes, you can use this as a backdrop, but it is strong enough to work as an adventure on its own as well. While the leitmotif is not necessarily new, the prose elevates it in its evocative execution; the added convenience and focus on usefulness at the table further add to the value of this pdf. 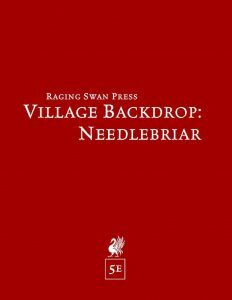 Needlebriar is a phenomenal supplement, even in the context of the Village Backdrop-series and the insane quality-level the series has established. While the conversion relic is slightly annoying, it is not enough to drag down what must be considered to be a great supplement. All in all, this is fantastic village, well worth 5 stars + seal of approval – if you’re looking for a great environment to explore, this delivers in spades. You can get this awesome village here on OBS!